There has been much gnashing of teeth in the media lately regarding what appears to be an unprecedented run up in crude oil prices, in particular since the US Federal Reserve dropped their prime interest rate a couple of weeks ago. Last time I bothered to look at oil prices was May 2006 where I postulated that peak oil phenomena originally manifested itself around January 2002 — a local low in oil prices. Since then, the price for oil has been trending upwards, more or less linearly. Since everyone seems so keen to blame futures traders for this, I thought I would look at the numbers and see just how far debased from this linear regression the price currently is. Is it a six sigmaTM event? Or merely likely? I have since developed a correction to my model, which I now call McLeod's Omniscient Regression-fit for Oil-price Normalization (MORON). 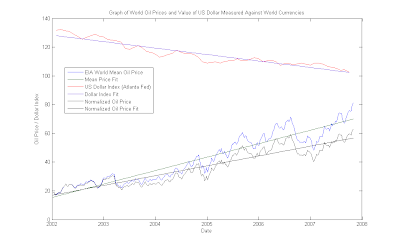 In this new model, I normalize the price of oil against the the Atlanta Fed's US dollar index, to account for the fact that that the US dollar has deflated (or devalued if you prefer) in value against the global bag of currencies by 20 % over the given time period of January 2002 – November 2007. The model utilizes the EIA's world average price for crude, which is a fair bit lower than the list price we see on the evening news. The EIA's numbers are somewhat less volatile than the future's prices, and frankly more representative of the price of gasoline and other oil products. To normalize to the value of the US dollar, I use the basket published by the Atlanta Fed. Note that this basket is actually favourable to the US dollar, since it allows some pegged currencies into the mix. Compared to the Euro or Canadian dollar, the US dollar's drop has been more precipitous. Still, a 20% drop over 5 years is nothing to sneeze at. from January 2002 to Novemember 2007 and least squares linear fits to data sets. From Figure 1 we can see that while there are clearly a number of periodic signals in the price of oil (blue), there also appears to be a background that we can reasonably approximate with a linear regression (green line). Fortuitously we can also plot the US dollar index (red — abbreviated Index$) on the same axis, showing its gradual decline (magenta). If we multiply the dollar index by the crude oil price, we can arrive at a normalized crude oil price, (grey) compensating the influence of the declining US dollar, and its fit (black line). A close examination of the difference between the current oil price and its background suggests that it not a very significant event. It is clearly less significant than the peaks in 2005 and 2006. In fact, if you look prior to 2002, it is quite remarkable that the US dollar index hit a peak just two months after the price of oil started to rise. Perhaps this has something to do with trade deficits or some such thing? Nonsense I'm sure, a giant oil pig like the USA couldn't possibly be driving the value of its fiat currency down by purchasing a constant volume of a resource that continuously increases in price. The most interesting data from Figure 1 is encapsulated in Table 1. Namely, we get the slope of those nice curves, as well as the unpresented data from my 2006 post. The correlation is not wholly perfect, there is clearly some additional periodic signal in the result after subtracting away the linear fit. So looking at the change in the price of oil over time (i.e. the price velocity), has it changed since I last looked at it in 2006? It's changed from 9.56 to 9.36 US$/bbl·year. So in fact it's still less than one sigma difference, which is roughly a 68 % confidence interval. For reference, two sigma is about a 95 % confidence interval. The expected price for crude from the linear curve is 69.95 ± 5.33 US$/bbl in unadjusted dollars and 56.78 ± 4.55 Index$/bbl in normalized dollars. The stated error in this case is the root mean square (RMS) standard error. Compared to the actual final prices given in Table 1, then we're at +11.32 US$/bbl but only +6.02 Index$/bbl. On the US dollar scale, the jump up in oil prices looks possibly significant, but there's nothing at all of interest from the crude price normalized by the dollar index. Another issue that one might be interested in is the spread between what the world actually pays, and the stock ticker for West Texas at Cushing, OK. Perhaps the traders are pushing that number up? Mean WTI spot crude price for the week of January 7th, 2002 was US$20.54/bbl, whereas for the the week of October 26th, 2007 it was US$89.23/bbl. The spread, then was $1.86/bbl (+9.96 %) back then and $7.96/bbl (+9.8 %) now. The proportional surcharge for that convenient oil appears to be remarkable stable. One's dollars still buy an equivalent number of barrels of WTI crude compared to the world average as they did back in 2002. Now, the data that I've used is a couple of weeks old, but there's no getting around that. If you want to use the up to the minute spot prices for a commodity, rather than what people actually end up paying, you'll quite possibly come away with the wrong impression. Overall though, it seems clear, this run up in price is not really different in any functional sense. The drop in the US dollar is a nasty little self-reinforcing cycle thanks to the fact that a very large portion of the US trade deficit is due to importing roughly 15 million barrels of oil every day. If anything, I am undercompensating for the deflation of the US dollar. If people aren't willing to purchase US debt to offset that money flow, well, the results are pretty obvious. Therein lies the fallout from the US mortgage crisis, in that the world's gone on a mortgage debt diet. Whether or not we will see any large shifts in crude oil prices due to the mortgage business remains to be seen. Thus far, my fairly simple analysis suggests we haven't seen any significant shifts. I enjoyed your analysis of the oil price data. The headline grabbing spot prices don't tell the whole story. The investment cycle in oil and gas is just getting started. The multi billion dollar projects are based on long term increases in the oil prices. I'm also interested in the development of Canadian Oil Sands and the relationship between the planned gas lines (AK and McKenzie) and how US refineries cut the cord with Hugo Chavez and his 2MMBPD of heavy sour crude. I recently had a discussion with my friend about oil prices, and this is how I found your blog. The friend, who I debated with, supports widespread theory that the rise in the oil prices in 2000+ is the result of the wars in Iraq and Afghanistan. He later refined his point of view, claiming that the cost of wars resulted in deflation of dollar, which resulted in the increase in oil prices. I am not an economist, but a physics researcher, so my main objection was based on the graph showing the dependence of oil prices on time: it seems that a straight line is a rather good fit to the price increase. But a good fit would start at the dip in 2002 or even in 1999 and continue well beyond the Bush's presidency. So the correlation between the wars and the price of oil is doubtful. In addition, apparently most of the local features in the graph are explained by "oil events" unrelated to the wars. I will appreciate your opinion or useful references. 1. Do I understand correctly from your post that the dollar deflation alone (regardless of what caused it) cannot account for the rise of the oil prices? 2. Do you think there is any significant/systematic relation with the wars in Iraq and Afghanistan? Sorry, that this sounds too amateurish. I appreciate your help.